Umbrella Games acaba de publicar Minescape, una reinvención del "Buscaminas" adaptada para Smartphones. Con una factura técnica envidiable. Si quieres un juego para pensar, no lo dudes. Tras un par de minutos iniciales en los que adaptarse a la mecánica a seguir dispondremos de una gran cantidad de niveles. 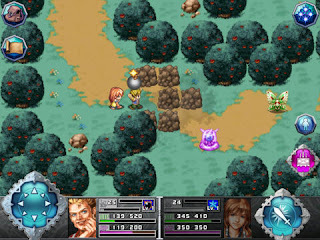 Minescape funciona de la siguiente forma. Unos puntos conectados con otros presentan un número que indica a cuántas bombas están conectados. Tu misión es interceptar las bombas haciendo un rápido cálculo ya que cada nivel nos da un tiempo límite. 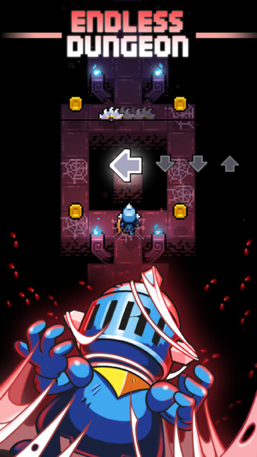 Redungeon es un juego muy divertido que nos traslada a una mazmorra infinita que se va generando aleatoriamente. En este juego somos un héroe que podemos controlar con una sola mano y nuestro dedo pulgar. Deslizar hacia arriba, izquierda, derecha… Para movernos mientras esquivamos una gran variedad de obstáculos y recogemos monedas que más tarde servirán para comprar vidas y desbloquear premios. En líneas generales es un juego muy divertido y que te engancha, vamos. Pero tiene un defecto desde mi punto de vista y es el constante acoso con la publicidad. Yo, que suelo ser bastante tolerante con la forma de ganarse la vida de los desarrolladores no comparto en absoluto que desde el minuto uno mueras y ya quieran presentarte un vídeo publicitario. Video que puedes saltarte pagando monedas o reiniciando la partida. Dicho todo esto, no deja de ser un juego con una excelente jugabilidad y buena factura técnica. Más de lo que aparenta en un principio. Tras esos preciosos gráficos que parecen de caramelo y unos controles sencillos (sólo nos movemos de izquierda a derecha) se esconde todo un juego de plataformas en el que para ir avanzado debemos sortear obstáculos en el momento preciso. Ni más, ni menos. 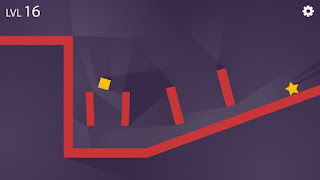 Hacen falta reflejos y calcular muy bien como superar cada prueba que nos impone cada uno de los 21 niveles de Pitweenk. 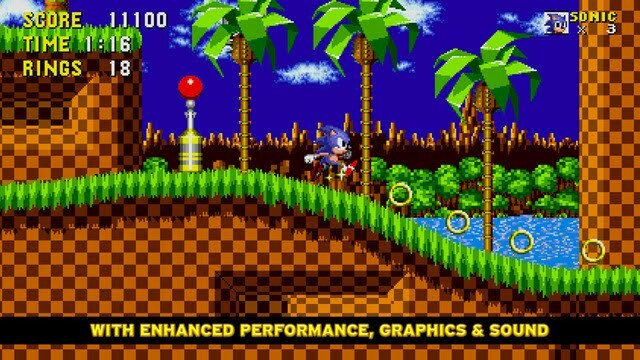 Factura técnica muy buena, gráficos muy correctos y sonidos estilo 8-bits nos devuelven a tiempos de Mario y Sonic con unos controles sencillos acordes a la capacidad táctil de nuestros iPhone. 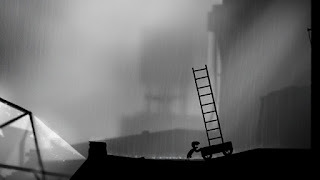 Uno de esos juegos en los que te atascas en algún nivel y te das de cabezazos hasta que no consigues pasar al siguiente, y lo digo por experiencia. La versión gratuita es el juego completo pero incluye publicidad. La mecánica de Bonecrusher es sencilla. Somos una calavera que puede moverse de izquierda a derecha dando toques en la pantalla. Mientras, los enemigos intentarán aplastarnos cuando intentemos recoger huesos, que son algo así como bonus para nosotros. Buena factura técnica, un juego sencillo para pasar unos niveles en los ratos libres. Eso sí, hay que tener muy buenos reflejos. Este es uno de esos juegos que considero perfectos para lo que es un smartphone. Sacas el teléfono mientras vas en el autobús o esperas el Metro, echas una partida rápida y ya continuarás más tarde. .
Risky Rooms viene con 50 niveles, de apariencia sencilla. Eres un cuadrado y tú única misión es avanzar entre peligros tocando la pantalla. Un toque avanzas, sueltas toque y te paras. Así de simple. Lo difícil es hacerlo en el momento adecuado. A pesar de la apariencia tan sencilla del juego lo cierto es que es de una factura técnica muy cuidada y el ambiente "dark" da un toque muy chulo. Aviso a navegantes, el juego desespera lo suyo. A partir del nivel 5 ya comienzas a morir unas cuantas veces tratando de pasar al siguiente. Sencillo juego donde lo único que hay que hacer es tocar la pantalla para movernos de izquierda a derecha y esquivar diversos obstáculos. La puntuación aumenta según ayudamos a nuestra medusa protagonista a subir a la superficie. Siguiendo la moda Flappy Bird pero añadiendo 2 controles en vez de uno. Visualmente precioso. The look & feel of 8-bit retro games is alive. 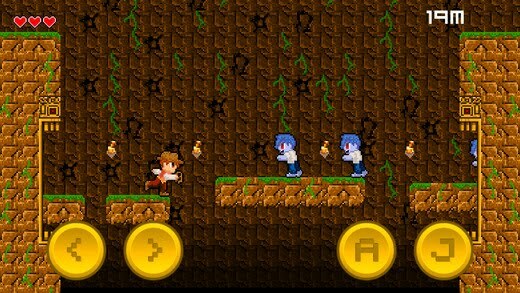 Even in the more and more powerful iPhone there is room for this sort of games. Nostalgic is alive. This is a list of some of the best 8-bits type games in the App Store. Enjoy. 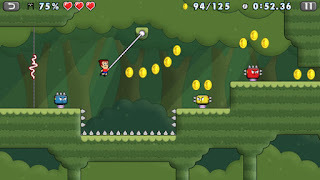 According to a review from Padywac: The first Across Age was very fun, addictive and well worth the price! This follow up game is even better! Super fun! A little heavy on the dialog in the beginning, but that eases up until the end. Buy this game! You will not be disappointed! I just hope they come out with a third. Build your own home and survive in a random generated world full of danger. Monsters, treasures and lot of secrets. For Minecraft fans. 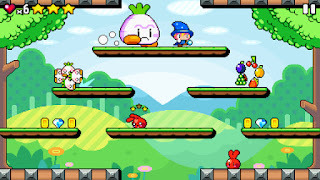 Retro style and funny and colorful pixelated graphics. 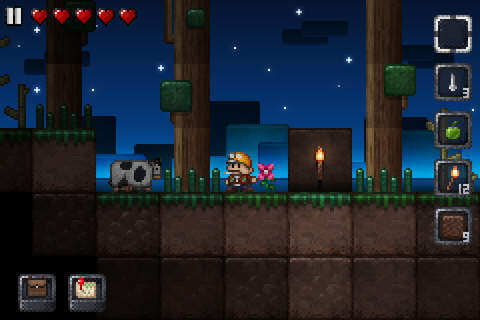 Explore random generated worlds in both survival or creative mode. In this game limit is your imagination. I literally spent hours in this fantastic game. Play in creative mode with unlimited resources or mine deep into the world in survival mode, crafting weapons and armor to fend off the dangerous mobs. 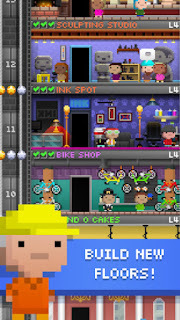 Very addictive, Tiny Tower lets you build a tiny tower and manage the businesses and bitizens that inhabit it! The Black Dragon has stolen the treasure of Faraway Kingdom. You, faithful Knight - follow the Princess’ order to slay the Dragon and retrieve the treasure! When bandits bust out of jail, it's up to you, Sheriff, to catch them. Journey across vast plains on your trusty steed. Dive into flooded town ruins. Take missions to earn extra money, then spend it on fancy hats and shiny belt buckles. Gamble at casinos and drink at saloons. The legend of the Old West rides again! You can two things. Stay alive, run and kill zombies. Very good retro look. Very good controls. 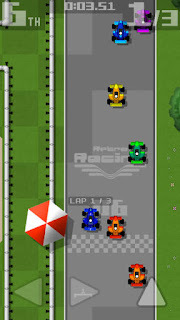 From the same developer behind the classic Amiga racers, Nitro (Psygnosis) and ATR (Team17). More than 500 five stars ratings. Very fun racing game. Very easy to play. It is like the old arcade machines racing games. If you liked the 90's 8 & 16 bit platforms games generation this your place. 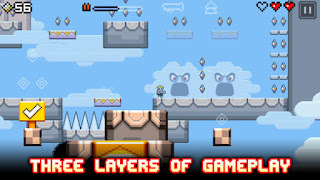 I have collected here the best iPhone Platforms Games I have played so far. Enjoy! Feel free to add suggestions in comments. Race at lightning speeds across seven classic zones as Sonic the Hedgehog. 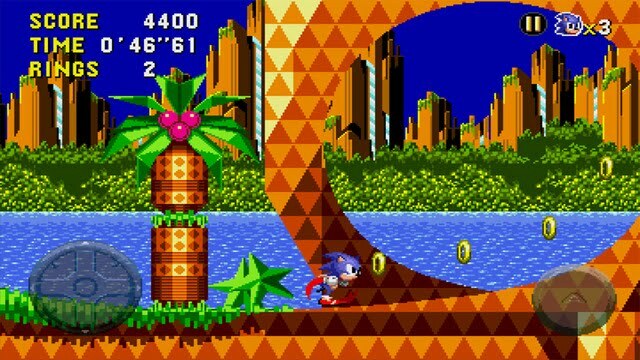 Run through loop-de-loops as you collect rings and defeat enemies on your mission to save the world from the evil Dr. Eggman. 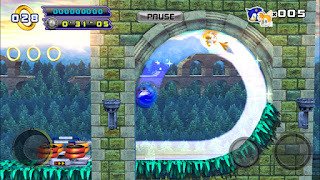 The Mega Drive Classic from 1991 revamped for iOS. 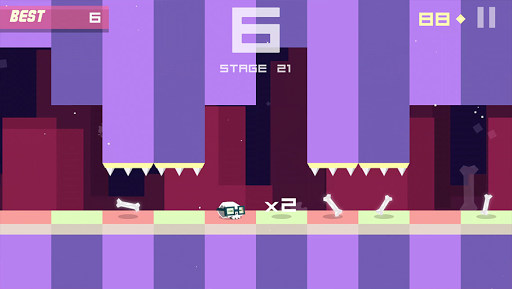 The new Platforms game on the App Store. Think, run & jump! 21 Levels, 21 Stars, dozens of enemies! Easy left-right controls. 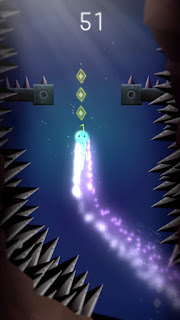 Pitweenk is an awesome platform game for iPhone with a simple gameplay and cool graphics. Did I mention it is very addictive? Drop Wizard is an action arcade game. 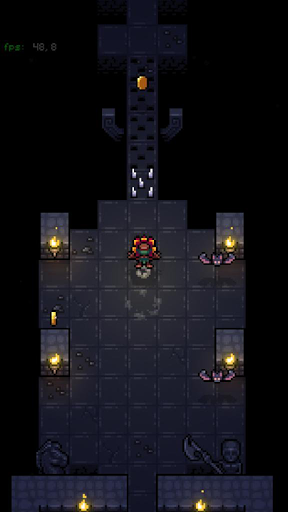 You will play as Teo, a wizard on a quest to save his friend turned into stone by an evil warlock. 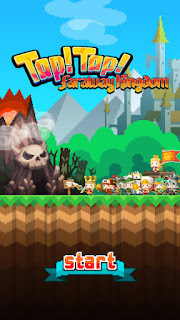 Clear all the levels, face bosses, collect power ups, score epic combos and many more in this great game. Mario Bros feel. 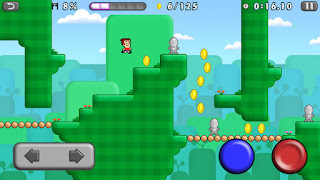 "Lep's World" is a platformer, with nearly 175 million downloads! 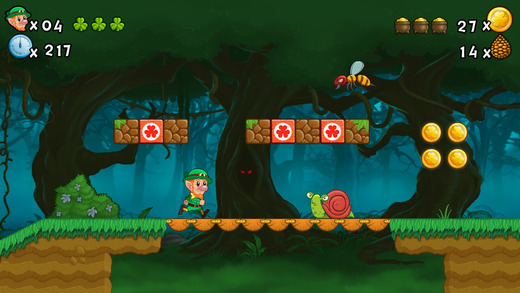 Be nimble... be quick... and help Lep find his gold. 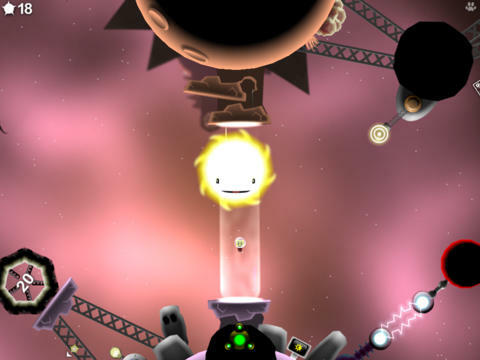 It's hidden in a range of awesomely well-designed levels, and he's determined to find it all! 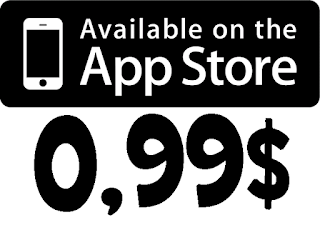 Now a classic on the App Store. 5/5 - "The best game ever! I love it so much, I can't stop playing it!" 5/5 - "It's a lot of fun, regardless of your age!" 5/5 - "This is the best app on my iPad, by far! 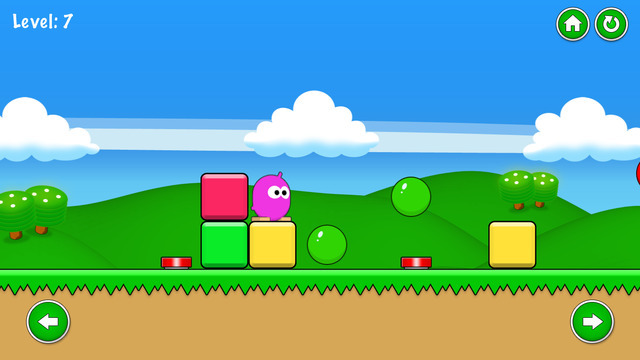 Highly addictive!" When the bandits bust out of jail, it's up to you, Sheriff, to round 'em up. Journey across vast plains on your trusty steed. Dive into flooded town ruins. Take on mini missions to earn extra cash, then spend it on fancy hats and shiny belt buckles. Gamble at casinos and drink at saloons. The legend of the Old West rides again! 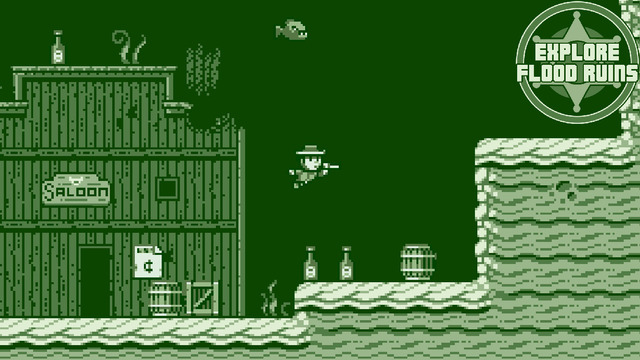 You will play as THE Bernie O'Tag in an action/adventure/platformer/runner that will push you to the brink with a challenge worthy of the old school. Awesome cell shaded graphics. Supporting MFi controller! When idols die - legends are born! 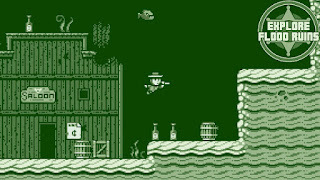 More than 25 years ago Armin Gessert developed with GIANA SISTERS one of the first Jump'n Run games for the Commodore 64. The console manufacturers got anxious and tried to stop the sisters. The end seemed close. But they failed and GIANA SISTERS with packaging has become a rare collector's item. Revamped old school classic with a Mario Bros feel. From the creators of the award winning platform game League of Evil comes Ravenous Games' new action platformer Random Heroes!! Excelletn 8-bits console graphics. Love pixels? 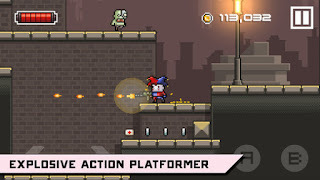 Like platformers? Is there a special place in your heart for the 8-bit and 16-bit era? Want to have fun? Yes!? Well, you’ve come to the right place, my friend. 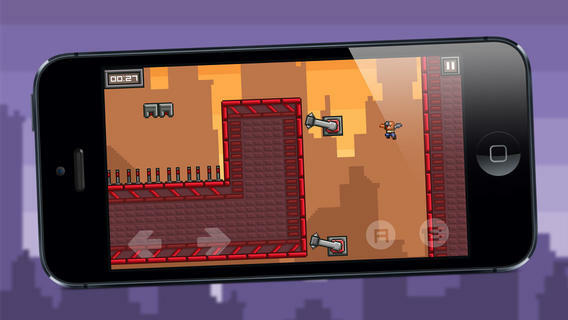 Mutant Mudds is a “12-bit” action platformer full of pixels and platforming fun! Very fun game with an old school platformer feel. Following the events of Episode I, Metal Sonic has returned to form a formidable alliance with Dr. Eggman! To face this new evil, Sonic will have to call upon an old friend to help him save the day! Now joined by Tails, race across four brand new Zones and take down fearsome new badniks with deadly combination moves in order to put an end to this dastardly duo’s plans! 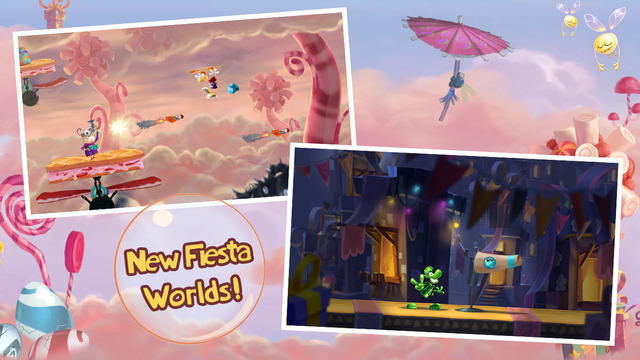 Join legendary platforming hero Rayman for a new adventure on your favorite mobile device! 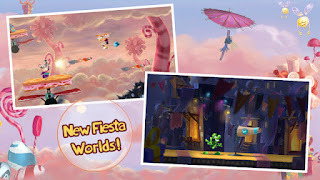 If you enjoyed Rayman Jungle Run, winner of the App Store’s BEST of 2012, you will love Rayman Fiesta Run and its new wacky Fiesta world! Lunge for cocktail umbrellas, leap on limes and punch those piñatas…the sky’s the limit! RUN, JUMP, SLIDE, and HOOK! 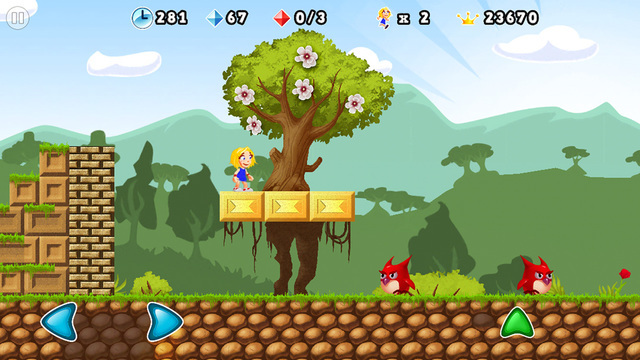 Collect coins and find hidden Golden Shorts! Watch out for enemies and spikes! 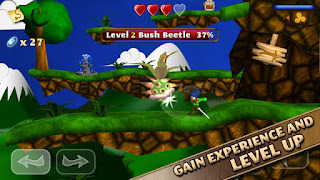 Swordigo is now free! 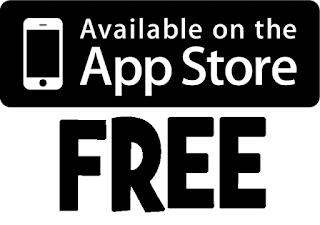 If you own an earlier version of Swordigo, you will continue to have an ad-free experience and will receive the coin doubler in-app-purchase for free after updating. Get ready for the GREATEST platformer with the most responsive controls to hit the App Store yet! The world needs your help! Evil scientists worldwide have joined forces forming a "League of Evil"; the only super agent who can stop them is YOU! As a specially trained agent you can double jump, flipping your way over obstacles. 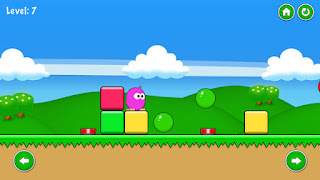 You are also trained in wall jumping gaps to reach new heights. 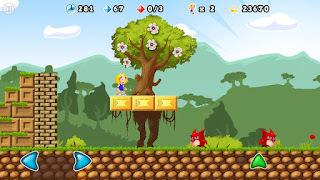 So get ready to show your sick acrobatic moves across 160 challenging levels! 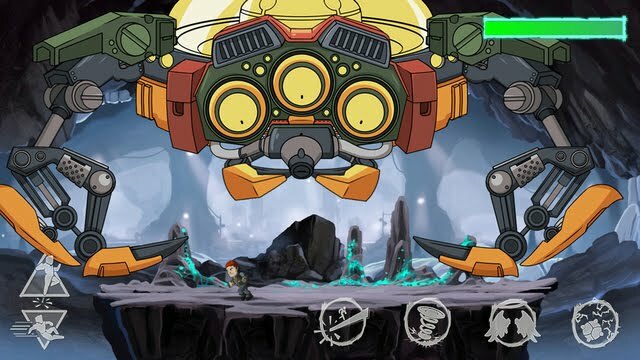 Fight your way through your mission and find the mad scientist to deliver a well earned pixel punch in the face! 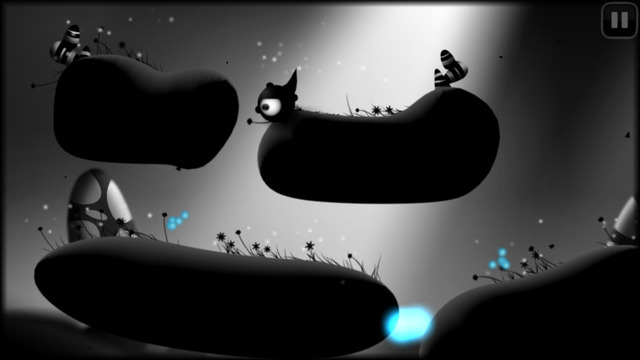 Use your finger to morph the landscape, propelling the mysterious creature Petit to safety. Pull, swipe, and tap gadgets such as tendrils, air geysers, and pulleys to complete clever puzzles. Set to a poignant orchestrated soundtrack from composer David Ari Leon, Contre Jour both delights and bedevils from start to finish. A must have if you played the Sega 16-bit generation in the 1990's. Fantastic controls and awesome feel of playing like in a gamepad. Five big worlds and dozens of levels. 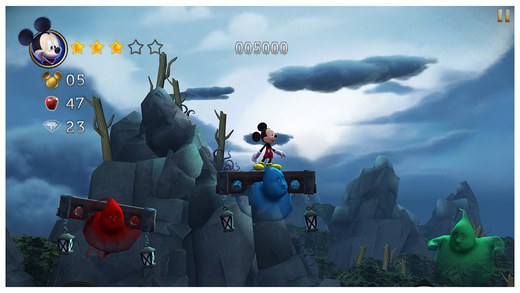 Mickey Mouse returns to star in Castle of Illusion, a fantastical reimagining of the Sega Genesis classic. When the evil witch Mizrabel kidnaps Minnie, it’s up to Mickey to brave the dangers of the Castle of Illusions to rescue Minnie. This game was elected one of the Best App Store Games 2012. RUN, JUMP, and SLIDE to save the day! 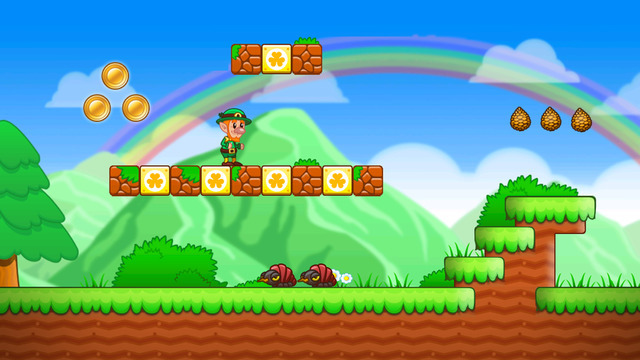 Collect coins and find hidden Golden Shorts! Earn more stars with faster times! 90's edition of Sonic CD adapted to iOS. 9/10 IGN. 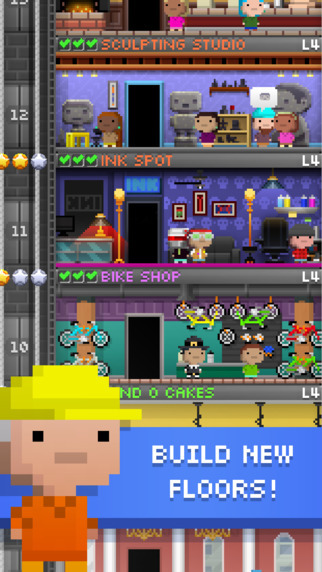 5/5 Toucharcade. Sonic travels to the distant shores of Never Lake for the once-a-year appearance of Little Planet - a mysterious world where past, present, and future collide through the power of the Time Stones that lie hidden within it. 21 Levels, 21 Stars, dozens of enemies! 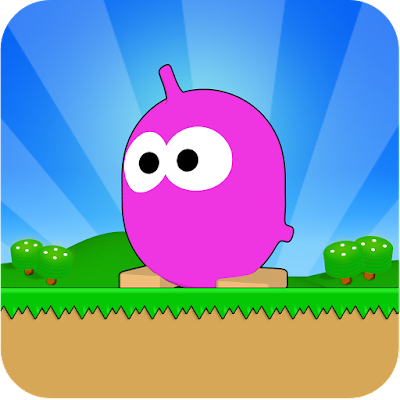 "Simple, funny, cool and very addictive"
"One of the best platforms games of the App Store!!" "Highly recommend to check it out!" "For Mario and Sonic fans"
"Pitweenk is one of the best iOS platform games"
"Incredibly good and addictive game"